Click on links below on each Sector for FULL Itineraries and Registration forms. If you’re going to honour and dance the Goddesses, why not do it on the Island of the Gods? If you’ve enjoyed Dance of the Deities, or just seen it and been curious, this is your chance to dive even deeper, to embody the deities from within while absorbing their sacred essence from your surroundings. Come Home to where the goddesses are said to reside and learn as much as possible about how you can express, heal and truly LIVE the parts of you they speak for. Every morning we’ll join together for daily yoga practice in the beautiful surroundings of the Yoga Shala in Ubud. Each afternoon we’ll immerse ourselves in the day’s Deity, with philosophy, mythology, and an embodied dance. You’ll have the chance to learn, embrace, and to explore and integrate the goddesses while soaking up the sacredness of Ubud’s natural beauty. Our yoga and dance practice will be broken up with excursions to sacred locations where we can make offerings, and take part in local rituals to give gratitude to the gods and goddesses we want to connect with. Over the week, we will dance Kali, Durga, Lakshmi, Saraswati, and Sita, so you can have the opportunity to fully embrace the power of your Shakti. Kali, the Great Fierce Protectress, reveals her most stunning gifts of Benevolence, Compassion and Deep Love. Durga dances with Grace and Fearlessness where the The Power of Love Triumphs over the Love of Power. Lakshmi’s dance of Prosperity leads us to the Depths of our Hearts Desires and The Souls calling to Love. Saraswati flows into the Creative Essence of our Soul so that our sweet music and arts are expressed into the world. Sita’s dedication, courage and sacrifice paves the way to success, prosperity and happiness. Full Balance to Be Paid by May 9th, 2018Get in quick with Earlybird and Subtract AU $200 from the prices below!! www.theshalabali.com/Please let us know if you are vegetarian or have any special dietary needs that need to be catered for. Upon registration and deposit I will send through further details and list of things to bring. Numbers are VERY limited so early expressions of interest are absolutely advised!! Join us on an inspiring 15 day Italian journey for all the senses. A true celebration of ‘La Dolce Vita’ with fabulous food, wine, yoga and song! Siena, Florence, Chianti, Milan, Lake Como, Verona and Umbria. We will visit the most iconic opera houses of the world (La Scala in Milan, the Arena in Verona and St Marks Church in Florence) and experience two included concerts. Your troubadour for this journey is world class soprano Tania de Jong AM who will serenade you along the way with special spontaneous songs, performances and opportunities to join in. And to calm our minds, soothe our souls and flex our bodies we will be under the superb guidance of international yoga teacher Andrew Mournehis. There will be grand dinners in gorgeous historic locations, cooking classes, wine tastings, gondolas, market visits, voice and yoga workshops, opportunities for private tuition with Tania and Andrew and much more to delight and entertain you! Accommodation will be in outstanding properties throughout Italy. There are limited places and these will fill quickly! The First Step begins by registering today…. Please Note: Numbers are limited, and places fill fast, so early expressions of interest are advised. Tania de Jong AM is Founder of Creative Universe, Creativity Australia and Creative Innovation Global, Dimension5, The Song Room, Pot-Pourri, MTA Entertainment & Events. Tania de Jong is a trail-blazing Australian soprano, award-winning social entrepreneur, creative innovation catalyst, inclusion-ista, spiritual journeywoman, storyteller and global speaker. She works across the public, private, creative and social sectors. With a grandmother who invented the first foldable umbrella, creativity and innovation are in Tania’s blood. And as the daughter of Holocaust survivors she has learnt about resilience and re-invention and developed a passion for diversity and social inclusion. When she was just 14 years old her best friend told her not to bother having singing lessons. So it’s not surprising that her mission is to change the world, one voice at a time. Tania presents keynote speeches, leadership programs and workshops inspiring creative leadership, entrepreneurship, social inclusion, diversity and innovation globally. Tania is the Founder of two charities. Creativity Australia works with a range of marginalised individuals (including migrants, people with depression and disabilities and job seekers) and communities to build supportive networks through the acclaimed “With One Voice” choir social inclusion programs. Creativity Australia received the 2016 Melbourne Award for Contribution to Community by a Community Organisation. The Song Room, which Tania also founded, has provided access to creative learning and wellbeing for over 350,000 disadvantaged Australian children since 1999. As well as creating these charities, Tania is also the Founder of Creative Universe transformational leadership and innovation capability programs, acclaimed opera/music theatre group Pot-Pourri and MTA Entertainment & Events and Creative Innovation Global which presents the acclaimed Ci2010-Ci2016 future-shaping innovation conference events. Ci2013 and Ci2015 were named Corporate Event of the Year in the Global Eventex Awards and Ci2015 was also named in the Anthill Smart 100 and Australian Corporate Event of the Year. Most recently, Tania was one of the recipients of the Impact 25 Award which recognises the not-for-profit and social sector’s most impactful individuals of 2016. Tania has recently founded a co-working space called Dimension5 in Melbourne to drive social innovation and collaboration. Tania released her first solo CD Heaven on Earth in 2015 and is working on a new CD entitled Flying Free. Andrew Mournehis is a highly sought after Teacher Trainer, who has come from a diverse Yoga background and brings great depth and passion to his teaching, which is underpinned with Hatha, Bhakti and Tantra Yoga. His creative, joyful and heart-filled teaching strengthens the body, soothes and clears the mind, whilst enlivening and enriching the Spirit through postural/universal alignment. His unique teaching style is imbued with heart and soul, rich in Tantric philosophy and his classes are filled with inspiration, story-telling, mantra and the Spirit of the Divine. Andrew is Creative Director of “Divine Grace” www.divinegrace.com.au and has been a teacher/lecturer at the “Academy of Yoga Learning” Teacher Training Course in Melbourne since 2003. His further interests extend into History, Philosophy , Mythology, Yogic Physiology, Human Energetics, Human Potential and how to discover, and live, one’s true Life Purpose (Dharma). Andrew Mournehis also graduated from the Phoenix Institute of Australia in 2001 (Adv. Dip. Transpersonal Counselling), with a very clear vision that his gifts and passions were best directed in the power of group. Being an already well respected and established yoga teacher, he spent the next 15 years combining his love of Yoga with the healing qualities of Transpersonal work to create transformative spaces for healing, where we can all practice together, exchange stories, and ultimately become more whole. He has facilitated hundreds of healing groups, yoga workshops, intensives and retreats both nationally and internationally working with the healing potential of both Yoga and Transpersonal work. 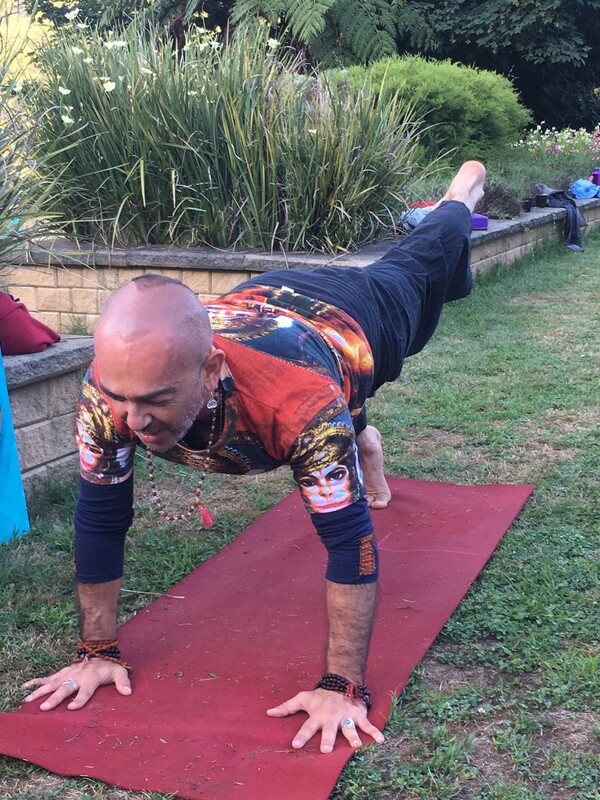 Andrew has been teaching in Melbourne for nearly 20 years, and is a dedicated and devoted yoga student and teacher…in fact an Eternal student. “I came to yoga through personal crisis and injury, and having intimately explored the power of healing that yoga brings, I hold complete trust in its healing power, potency and potential. Each divinegrace yoga class will connect you with your Divine Nature, inviting YOU to remember your highest good, and that EVERY aspect of our lives is an opportunity for growth and illumination. Whether life feels fulfilling or empty, light or dark, filled with pleasure or pain…all is seen as an opportunity for transformation and revelation… from the darkest of places, Great Beauty, Light and Wisdom can be revealed”. This always promises to be a beautiful, peaceful and tranquil weekend , with like minded souls who wish to co- create their Visions with the Universe, expressing their Divine Spirits through Yoga Practice, Meditation, Creative Activities, Workshops and of course designing and creating our VERY OWN VISION BOARDS for the year 2018. The Year of the Earth Dog promises to be an eventful year, particularly for those seeking work advances and lifestyle changes. As the Earth Dog is talented, perceptive, and an extremely efficient and proactive worker, this will be an excellent year for the start of new business ventures. Satisfaction, joy and rewards reaped from projects undertaken in the previous year, can best be appreciated by sharing with others. Abundance will flow for those who choose honesty and fairness in their dealings, and there will be a greater movement towards empathy and social justice in work relations. Amongst all the Chinese Zodiac signs, Dogs are renowned for being kind, generous, loyal, trustworthy and always ready to lend a helping hand to others. Dogs are admired for their integrity and confidence, and calm in the face of a crisis. In order to gain fulfilment throughout the year, it will be necessary to be noble, just and fair to gain material and spiritual wealth. In 2018, success in love and work depends on communication and care between people… selflessness rather than selfishness …and generosity will bring the most abundant harvest. ​Come share this pivotal weekend with a Loving “pack” of mindful, playful, curious, kind souls, committed to bring more goodness into world. Let this weekend show what “man’s best friend” truly means! Give this as a GIFT to YOU to prepare for a SPECTACULAR year ahead. ALL meals from Friday Dinner to Sunday Lunch are inclusive. Aim to arrive around 6pm Friday evening to settle in, choose a room, have a light meal at 7pm and Opening circle at 8pm. All meals are vegetarian. Please let me know if you have any special dietary needs that need to be catered for.